One gets an eerie sense of deja vu watching John Kerry battle the Bush clan. He's done it once before, against the old man, President Bush's father, though many voters have probably forgotten. That battle involved the first Bush administration's attempt to put the lid on an investigation that connected a worldwide criminal bank to narco-traffickers, terrorists, and to Middle East money men who helped the Bush family make piles of cash. Those links connect to people now on the U.S. post-9/11 terrorist list. In the late 1980s and early 1990s, Kerry fought to expose an international criminal bank, BCCI -- the Bank of Credit and Commerce International. The bank was run by a Pakistani, working with Persian Gulf managers who operated through a network of secret offshore centers to hide their operations from the world's bank examiners. They weren't, however, hidden from the CIA, which not only knew what the bank was doing, but used the bank to funnel cash through its Islamabad and other Pakistani branches to CIA client Osama bin Laden, part of the $2 billion Washington sent to the Afghani mujahideen. The operation gave bin Laden an education in black finance. CIA director William Casey himself met with BCCI founder Agha Hasan Abedi. The CIA also paid its own agents through the bank and used BCCI to fund black ops all over the world. Kerry took on not only the Bush clan and its friends, but the CIA, and members of Congress on both sides of the aisle. This is not irrelevant history, but important to examine, because it reveals a lot about Kerry and how he might have responded to terrorism or other global criminal enterprises. Kerry's record shows that he took on powerful political and bureaucratic interests, was a tenacious investigator, and savvy about international crime and money flows, which is crucial in the fight against terrorism. Against the opposition of powerful Republicans and Democrats, and in light of a lack of cooperation from a very politicized Justice Department and stonewalling by the CIA, Kerry worked with investigators and ran Senate hearings that exposed the bank's shadowy multi-billion-dollar scams and precipitated its end. BCCI was founded in 1972 by Pakistani banker Agha Hasan Abedi and initially capitalized by Sheik Zayed of Abu Dhabi. It incorporated in the bank secrecy jurisdiction of Luxembourg but operated out of London. During two decades, it expanded to 73 countries worldwide, with nearly a million depositors with accounts totaling more than $10 billion. When the bank was finally shut down nearly 20 years later, between $9.5 and $15 billion -- the analysts differ -- had been lost or stolen, making this the biggest bank fraud in the world. Drug cartels As early as 1985, the U.S. Drug Enforcement Administration (DEA) and the IRS found that BCCI was involved in laundering heroin money, with numerous branches in Colombia to handle accounts for the drug cartels. It ran accounts for the traffickers' protector, Panamanian dictator Manuel Noriega, as well as for the drug kingpins of Asia's Golden Crescent, including Burmese heroin warlord Khun Sa, and for drug trafficking Afghanis and Pakistanis. Illegal arms traders For the Afghanis, the rule was "drugs out, American and British arms in." Clients also included Middle East terrorist Abu Nidal, who used bank financing to get weapons; the sellers of nuclear technology to Pakistan; and Syrian drug trafficker, terrorist, and arms trafficker Monzer Al-Kassar. The bank served international organized crime involved in extortion, bribery, kidnapping and murder, and ran accounts for Philippines dictator Ferdinand Marcos, Haiti's Jean-Claude Duvalier, Liberian strongman Samuel Doe and other thieving heads of state who needed to hide their stolen cash. The Iran/Contra scandal BCCI had a role in the infamous scandal of the Reagan years. The CIA told Noriega to use the bank for the payoffs he got for helping National Security Council (NSC) staffer Oliver North set up shell companies and secret bank accounts in Panama to illegally move funds to the Contras in Nicaragua and arms to Iran in 1985-86. North had arranged to illegally sell 1,250 U.S. Tow missiles to Iran in exchange for a promise that Teheran would press militants in Lebanon to release American hostages. Adnan Khashoggi, a Saudi middleman and fixer, used a BCCI account to move $20 million for the illegal arms and money plot. BCCI prepared phony documents for the arms sale, and checks signed by North were drawn on the Paris branch of BCCI, which "had no records" of the account when U.S. law enforcement later sought them. The profits were sent to Nicaragua's right wing Contra rebels, violating a congressional ban on such aid. Saddam Hussein During the Reagan-Bush support of Iraq as an adversary to Iran, BCCI funneled millions of dollars to Baghdad's banker in the U.S., the Atlanta branch of the Banca Nazionale del Lavoro, (an Italian bank), so that from 1985 to 1989 it could make $4 billion in secret loans to Iraq -- money for arms. BNL was a client of Kissinger Associates, and Henry Kissinger was on the bank's international advisory board along with Brent Scowcroft, who would become Bush Sr.'s National Security Advisor. BCCI's global connections also helped bring private profit to the Bushes. Former Senate investigator Jack Blum told me, "This whole collection of people were wrapped up in the Bush crowd in Texas." Prominent Saudis played a key role: Khalid Bin Mahfouz, head of National Commercial Bank in Saudi Arabia, and a major investor and BCCI board member; Kamal Adham, brother-in-law of the late Saudi King Faisal, former head of Saudi intelligence and a major shareholder and frontman for BCCI, and; Ghaith Rashad Pharaon, a BCCI shareholder and front man for the bank's illegal purchase of three U.S. banks. Then there was James Bath, a Texas businessman, who owned Houston's Main Bank with Bin Mahfouz and Pharaon. When George W. Bush set up Arbusto Energy Inc. in 1979 and 1980, Bath provided some of the financing. As it turned out, Bush was not much of a businessman, and when Arbusto needed a bailout, political connections eventually got him a buyout by Harken Energy Corp., which paid him $600,000 in stock and a $120,000-a-year consultancy. BCCI-connected friends were there again with money to help when Harken got into trouble. Arkansas investment banker Jackson Stephens in 1987 worked out Harken's debts by getting $25 million financing from Union Bank of Switzerland (UBS), a partner with BCCI in the Swiss Banque de Commerce et de Placements. As part of that deal, a board seat was given to Harken shareholder Sheikh Abdullah Taha Bakhsh, whose chief banker was BCCI shareholder Bin Mahfouz. Were the Bushes putting their financial interests ahead of American security? Given the Bush links to BCCI, it's not surprising that the Bush administration tried to smother the investigation and prosecution of the bank. It might have succeeded, were it not for New York District Attorney Robert Morgenthau -- and the junior Senator from Massachussetts, John Kerry. As a former prosecutor, Kerry knew a lot about the workings of financial crime. Kerry pointed out how billions of dollars looted from U.S. savings and loans in the 1980s -- after Ronald Reagan deregulated the thrift industry -- had been stashed in secret offshore accounts. After he became head of the Senate Subcommittee on Terrorism, Narcotics and International Operations, Kerry had wanted to look into cocaine trafficking by Contras fighting the Sandinistas in Nicaragua and the connection to Oliver North's illegal offshore Contra-support operation. So, in 1986, Kerry hired Washington lawyer Jack Blum to head the investigation. As an investigator for Senator Frank Church's subcommittee on multinational corporations, Blum had exposed the Lockheed bribes and ITT's attempts to destabilize the government of Salvador Allende in Chile. "The Foreign Relations Committee was looking at the relationship between drug trafficking and arms dealing and the way we run foreign policy," says Blum. "'Did we ignore all the stuff going on to support the war in Nicaragua?' We got into the issue of money laundering." Blum said he "stumbled across Lee Ritch," who told the panel, "I used to launder my money in the Cayman Islands. The U.S. wised up, and the bankers told me to shift to Panama. In Panama, I'm told the only guy to talk to is Noriega. He sends me to BCCI." Blum says, "We go poking around. I found a guy who had worked for BCCI. I met him in Miami. He said, 'That's their major line of work. They're a bunch of criminals.' He goes on to say that in addition to handling drug money, they were managing Noriega's personal finances and that the bankers who did that lived in Miami." Noriega even carried a BCCI Visa credit card. So Blum subpoenaed that information. He said, "There is a subplot between us and the federal government and prosecutors. We find out about coming arrests for money laundering [in an ongoing Tampa drug trafficking investigation], but the feds want to make only a limited case in Tampa; they don't want to investigate other ramifications. Their story is they had their case and didn't want it messed up with extraneous stuff. The notion the other stuff was extraneous boggles the mind." Blum began poking deeper and came across the CIA standing in the shadows. He found that during the 1980s, the CIA had prepared hundreds of reports that discussed BCCI's criminal connections -- drug trafficking, money laundering -- and its control of Washington's First American Bank, part of an illegal plot to get into the U.S. banking system. He also found that this was accomplished with the help of major U.S. figures, including former Treasury Secretary Bert Lance, former Defense Secretary Clark Clifford, former U.S. Sen. Stuart Symington, ex-federal bank regulators, and former and current local, state and federal legislators. The CIA provided its reports to Treasury Secretary Donald Regan but not to the prosecutors in Tampa. The Treasury and Customs departments also sat on evidence. Kerry tried to get the Bush Justice Department to expand the Tampa investigation or to turn its information over to the FBI or other agencies. It refused. Blum told me, "We started with laundering drug money, but then pursued it much further and got in testimony a pretty good layout of the criminal nature of the bank. Having done that, we wrote a report and said the matter needs further investigation. But the Justice Department doesn't pick up on any of the clues. I talked to them. I got a leading figure in the bank to turn evidence to the government, which didn't want to listen. I taped him for three days with undercover agents in a hotel room in Miami; the government didn't transcribe the tapes." The chief Customs undercover agent who handled the drug sting against BCCI was so disgusted, he quit. The Justice Department ordered key witnesses not to cooperate with Kerry, and it refused to produce documents subpoenaed by his subcommittee. The CIA also stonewalled or lied to the Kerry investigators. As a junior senator, Kerry was further hampered because his subcommittee mandate was limited to looking into terrorism and drugs. But even that investigation was bothering too many important people, so Clayborne Pell, a Democratic senator, shut it down. Then the Justice Department closed the Tampa case with a plea bargain that let BCCI off the hook. Kerry was furious. He thought the crooked bank should be shut down. He said the deal kept the bank alive and discouraged bank officials from telling the U.S. what they knew about BCCI's larger criminality, including its ownership of First American and other U.S. banks. However, the bank relied on its friends. Sen. Orrin Hatch (R-Utah) defended the plea bargain on the Senate floor, and then asked the bank to lend $10 million to a friend. Following the plea agreement, the Justice Department stopped investigating BCCI for about 18 months. It even lobbied state regulators to keep BCCI open -- after being urged to do that by former Justice Department personnel working for BCCI. 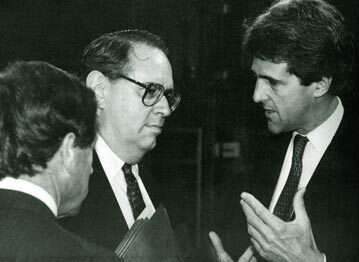 Kerry tried in 1990 and 1991 to get an investigation by the Senate Banking Committee, chaired by Democrat Donald Riegle. But Riegle and four of the other members of his committee had gotten money from Charles Keating, head of Lincoln Savings and Loan, who was later convicted of fraud, and they weren't interested in drawing attention to crooked banks. Finally, Kerry got permission to run a one-day subcommittee hearing in May 1991. Then he started holding public hearings through the banking committee, which wouldn't staff them; he had to use his own people. "Riegle considered himself a gentlemen, because he let Kerry do that," says Blum. "Riegle is probably the most misnamed U.S. senator." The bank's friends prevented more Kerry hearings, says Blum. "They got it out of Foreign Relations," he recalled. "We later learned that BCCI, between September 1988 and July 1991 when the bank closed, spent $26 million on lawyers and lobbyists trying to keep themselves in business. They hired people on both sides to shut [the investigations] down." But, Blum adds, "They didn't stop me from going to the New York County DA's office with Kerry's blessing to assure a prosecution would ensue." Blum went to see New York District Attorney Robert Morgenthau and told him about the Justice Department's refusal to investigate BCCI's involvement in drug money laundering and other crimes. The Justice Department and the Federal Reserve, run by Paul Volcker, refused to aid the DA's investigation. However, Morgenthau got a grand jury indictment of BCCI in July 1991. It said the bank and its founders had defrauded depositors, falsified bank records to hide illegal money laundering, committed millions of dollars in larcenies and paid off public officials. It charged that BCCI had been a criminal enterprise since 1972 and had paid millions of dollars in bribes to central bankers or other financial officials in a dozen developing countries. Morgenthau named Ghaith Pharaon as a front man for BCCI who had gotten a secret loan from the bank to invest in three U.S. banks. The New York Fed -- not Washington -- also took action. It coordinated an action on the fourth of July weekend 1991 to shut BCCI down. And, finally, the DA's investigation forced Washington to act, though it kept the case as limited as possible. Soon after, Assistant Attorney General Robert S. Mueller III (now head of the FBI) oversaw the indictment by a federal grand jury of Democratic influence-peddler and former Johnson Defense Secretary Clark Clifford and his protege Robert Altman -- the top officials of First American Bank -- for misleading the Federal Reserve Board about BCCI's secret control of the bank and obstructing the Fed's inquiries into BCCI. Altman got off after convincing the jurors that he -- an executive worth multi-millions of dollars in pay and stock benefits -- didn't know who the bank's true owners were. Clifford evaded trial because of the Pinochet defense: his health. In September, the Justice Department came up with an indictment of top BCCI officials which focused only on drug-money laundering, not on fraud against the bank's depositors. It ignored leads, witnesses and evidence that would have revealed the bank's large scale frauds -- and exposed CIA and Reagan-Bush use of the bank. "When I first looked at it, I thought there's something nefarious or embarrassing -- what is it? Their own incompetence? Worse? You never know the answer," says Blum. "There was the Fed, which looked stupider than hell, the Office of the Comptroller who were stupid beyond comprehension. The then head of CIA said, yes, the CIA had used the bank. Everything you touched about that bank led to somebody ugly. Margaret Thatcher's husband and maybe son, the prime minister of Canada, a 'who's who of politics and the worlds of skullduggery." In July 1992, a New York County grand jury indicted Khalid Bin Mahfouz and an aide for defrauding BCCI and its depositors of as much as $300 million. But Bin Mahfouz was in Saudi Arabia, out of reach, and in the end Morgenthau settled for a fine. The Fed fined Bin Mahfouz $170 million. The Justice Department didn't go after Bin Mahfouz at all. Federal prosecutors handling the Tampa drug money laundering indictment of BCCI did not use the information they collected to focus on -- or report to federal agencies -- BCCI's other crimes, including its secret, illegal ownership of First American Bank. The Justice, Treasury and Customs departments failed to support or aid investigators and prosecutors. Following lobbying by former Justice officials working for BCCI, the U.S. attorney in Tampa accepted a plea agreement that kept BCCI alive and discouraged bank officials from revealing other crimes. CIA chief Casey and the agency knew, by early 1985, a lot about what BCCI was up to and didn't inform the Justice Department or the Federal Reserve. "After the CIA knew that BCCI was, as an institution, a fundamentally corrupt criminal enterprise, it continued to use both BCCI and First American, BCCI's secretly held U.S. subsidiary, for CIA operations." The Federal Reserve approved the first hidden BCCI takeover despite evidence the bank was behind it because it was swayed by influence-peddlers such as Clifford and because the CIA and Treasury failed to raise warnings about what they knew. There's a lot about BCCI that outsiders will never know. Once the investigations started, there were seven fires in the fireproof London warehouses where BCCI stored records. In one of them, four firemen were killed. Kerry's experience fighting the Washington establishment over BCCI gave him a profound education in the workings of the insider Washington power and corruption that support corporate and organized crime and weaken the country's ability to counter terrorism. He showed that he has what it takes to stand up to the big-money special interests that don't want the system to change. During this presidential campaign, Kerry talked a lot about his service in Vietnam, but he didn't take credit now for exposing BCCI, perhaps because he thought it was too complicated for the American public to understand the scandal. Yet, more than physical courage, what the U.S. needs is guts and smarts and the resolution and courage to fight scourges that range from terrorism to international crime to corporate corruption and tax evasion. Jack Blum, who was not involved in the Kerry campaign, says: "There has never been a guy who has run for president who has, hands-on, known the kinds of substantive things he knows about the world of international crime, about banking and international bank regulation and finance, about the interconnectedness of the world finance system and how various intelligence agencies play into it. He is uniquely qualified."